The District Central is a unique ecosystem in Montréal, a vibrant area where start-ups, market leaders and cosmopolitan citizens thrive side by side. It's time you joined the movement and established yourself right here. The district for audacious, creative, determined entrepreneurs is right here. Advancements are made right here. Tomorrow is invented right here. It all happens right here. 5 sectors, the same vibrant energy. 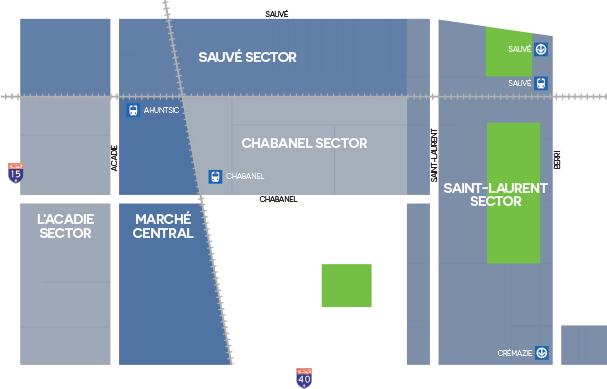 The District Central is home to the fourth largest concentration of employment in Montréal. Its main artery, Chabanel street, is at the heart of five sectors with distinct yet perfectly complementary ambiances. It's part of what makes the District a vibrant quarter where you can just as easily work as shop, eat, go out or entertain yourself.